Have you ever dreamed of having glamorous, polished curls? Or maybe romantic beachy waves… Or elegant tousled waves… Oh, where was I? Curling irons, right. 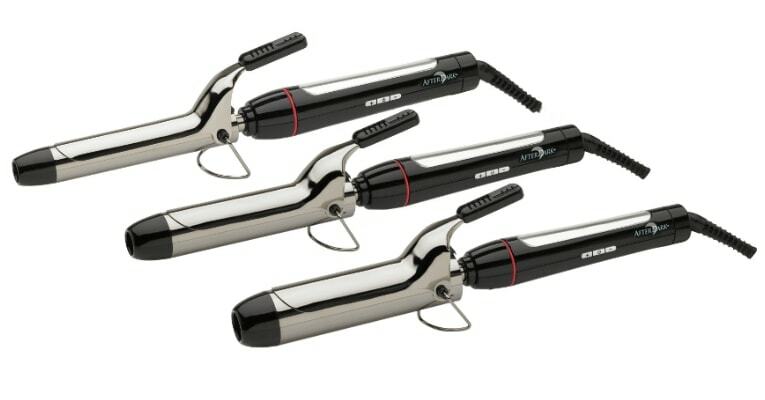 Not exactly – the best curling irons. Because here we talk about the best styling tools and hair treatments. For example, here are top 10 best straightening brushes. But let’s go back to the curling irons. Hi there! It’s me, Monica. Today I’d like to share with you my top 10 list of the best curling irons on the market so far. We’ll find out what is so good about them. Also, I’m going to explain what a curling iron is and how to choose it. Wonder how to use a curling iron? There is a guide right there! Well, a little later. In this very post, I promise. Finally, I will answer some questions about curling irons. Stay tuned! By the way, if you want to know more about styling tools, I answer all of your questions here. 1 What Is the Curling Iron? 1.1 What features to take into account when choosing a curling iron? 3 How to Curl Your Hair with a Curling Iron? 4.1 Do curling irons cause any harm to my hair? Which ones are safer and why? 4.2 How Do I Treat Hair That Is Easily Affected by High Temperatures? 4.3 How to Curl Your Hair without a Curling Iron? What Is the Curling Iron? As its name suggests, the curling iron is a styling tool that makes your hair curly – or wavy, depending on the features of the particular appliance. As with any other styling tool, it has plenty of features that should be considered before purchasing. We’ve already discussed what to bear in mind when choosing a straightening brush, and now let’s uncover the secrets of picking the right curling iron. What features to take into account when choosing a curling iron? 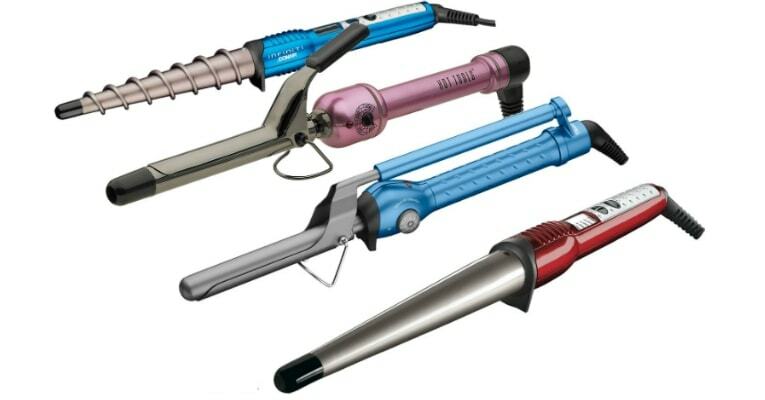 Curling irons typically are made of metal, ceramic, tourmaline, or titanium. When it comes to styling tools, ceramic and tourmaline are considered to be a rather healthy choice. These materials can be combined to enhance the work of the tool. 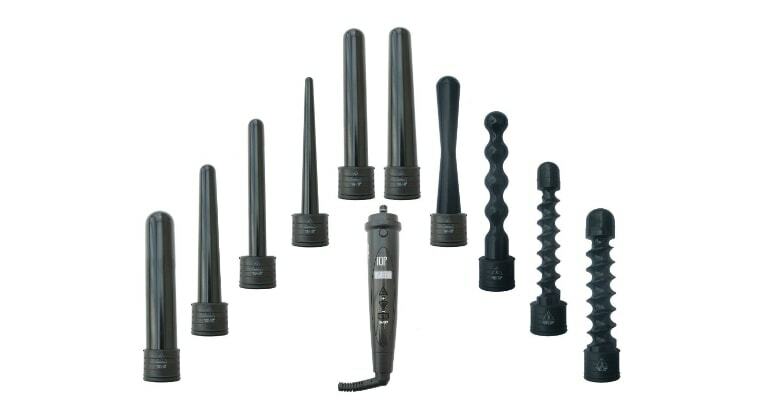 There are quite a lot of ceramic tourmaline curling irons on the market. Such coating helps to reduce static and frizz, leaving you with shiny and silky locks. If we’re talking ceramic VS titanium curling irons, which one is the better? 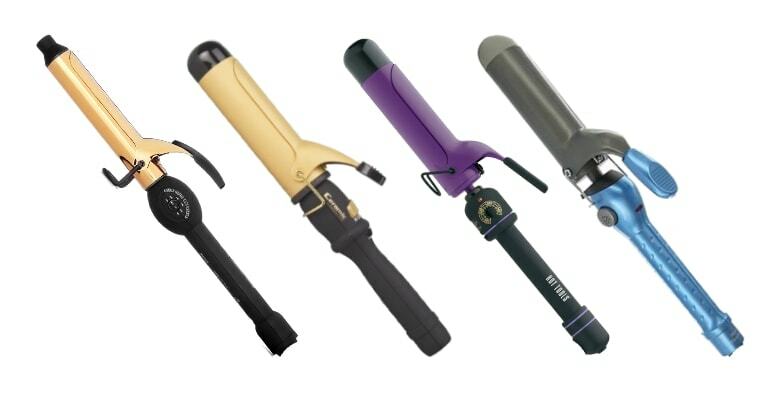 Titanium curling irons are way more powerful, so it’s a great tool for thick, dense hair that is hard to tame. For fine or damaged hair, I’d recommend you to choose something less forceful. Check out the detailed comparison of various coatings here. Curling iron sizes vary from one tool to another. The barrel’s diameter typically ranges from 0.5 inches to 2 inches, yet 1 – 1.25 inches is the most common diameter. Curling irons with smaller barrel are good at creating tight curls, ringlets, and spiral curls, while the larger barrel is suitable for making beachy waves, loose waves, and voluminous curls. For curling long hair, you can choose pretty much any barrel diameter. And if you have short or medium-length locks, the standard diameter of 0.5 – 1 inch will probably work well for you. One more thing: if your hair is thin and flat, go for curling irons with smaller barrels. Even if the curls lose shape throughout the day, the hairstyle still looks nice and sleek. Large barrels that create loose waves won’t provide long-lasting curls for that hair type. And vice versa, if you have thick hair that retains shape, go for larger barrels to make loose curls – the hairstyle will stay in for a long time. But keep in mind that 2-inch curling irons create rounded textures rather than defined curls. And it’s a good tool for making 90’s flipped ends, for instance. The barrel can be either cylinder-shaped or cone-shaped. If the first one makes curls that keep the same size throughout the hair length, then the second one gives you more creative look. 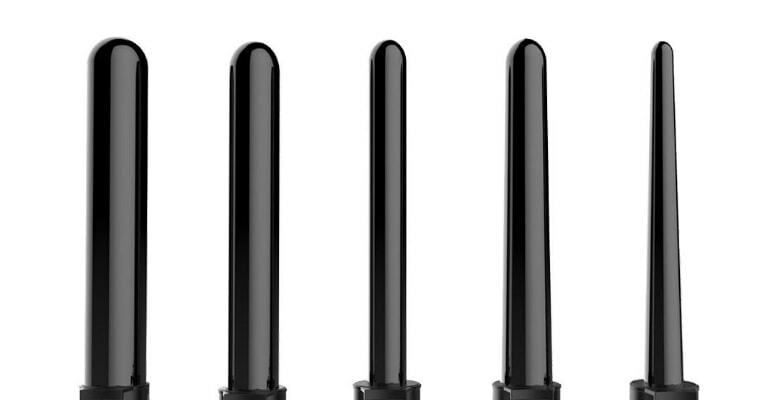 Coned-shaped wands usually widen from the point to the base, but they also come in reverse – with a thicker end and a smaller base. Such barrels let you create curls of different size with just one tool. Also, there are such things as a spiral curling iron, a pearl barrel curling iron, and even a triple barrel curling iron. All of them have their benefits and serve their own purposes. Different hair types require different temperatures, and you should keep that in mind when choosing a curling iron. Dense, thick hair usually can stand higher temperatures while thin, colored or damaged locks need lower heat level to reduce damage. When it comes to setting the heat level, follow the instructions for the particular curling iron you’ve purchased. As these tools vary in features, it’s hard to establish the universal rules on which temperature your hair requires. It’s recommended not to use temperatures above 400°F – leave such high heat to professionals. It’s better to stay somewhere between 300°F and 400°F if you have normal or coarse hair. If it’s thin, damaged or color-treated, start with something like 170°F. 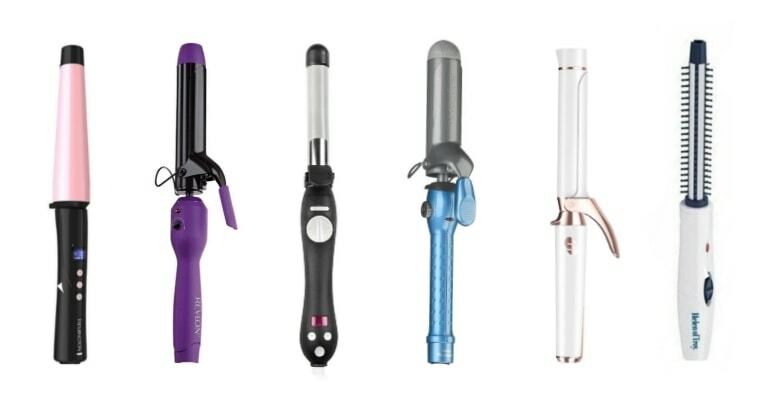 Finally, there are some curling irons without adjustable heat settings. Think twice before purchasing one of such tools. The heat may turn out to be too high or too low for your hair type. Curling irons have either a spring-loaded, clipless, or Marcel handle. In the first case, you use a spring to move the clamp up and down. That kind of handle is the most common. The only problem that may occur is a handle being too tight. When using a Marcel curling iron, you apply the pressure to the very clamp. A clipless wand has no clamp at all, and you just wrap your hair around the barrel. It’s easier to get burned, and that’s why most clipless curling irons come with a protective glove. These are quite useful features that some curling irons have. As its name suggests, tools with auto shut-off function will be switched off after some time of non-use. Usually, it’s 30 or 60 minutes. But even if your curling iron has an auto shut-off – I highly recommend you to switch it off right after using. Attention: Please, do not leave any electrical appliances turned on. If you have a dual voltage curling iron that means you can use it not only in the USA but also overseas. So, if you want to provide yourself with a travel curling iron, look for the one that features dual voltage. Just remember that you will probably need a plug adaptor so that it will fit a socket. As I always say – do some research before buying any styling tool. If some of your friends or relatives use a curling iron, that’s awesome! You can get honest opinion firsthand. Reading curling iron reviews on the Internet can help as well. Just be aware of fake reviews that are not uncommon these days. So, let’s get down to business and finally take a look at the best curling irons available on the market. The perfect solution for curling hair from short to long is 5 in 1 Curling Iron Set by Xtava. Get one device and multiply your hair styling options with the variety of nozzles available. This hair curler, as it is clear from its name, has five different barrels to suit different hair types, lengths, and curling intentions. In the set, you are going to find a 0.3 – 0.75 inch tapered clipless barrel, a 0.7 – 1 inch tapered clipless barrel, a 0.7 – 1 inch barrel with a clamp, a 1 inch barrel with a clamp, a 1.25 inch barrel with a clamp, and a heat-resistant glove to protect yourself from burn whatever barrel and hairstyle you choose. The process of styling will be safe for your hair as well thanks to the tourmaline ceramic technology. Negative ions which are produced by barrels will seal moisture in your hair and make it shinier and healthier-looking. With nine temperature settings, there’s no chance to overdry your hair, just select the regime between 250ºF and 410ºF according to your hair type. 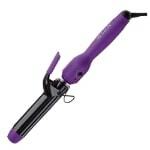 This revolutionizing Conair Infiniti Pro curling iron will definitely impress you. With auto-curl technology, your hair goes in, and the curls come out! You just need to comb your locks properly so that no tangles remain. Otherwise, this smart automatic curling iron just won’t curl them, and they may get stuck. There are 2 heat settings and 3 modes – for making loose, medium or tight curls for any hair type (that is 8, 10 or 12 seconds per one strand). The auto-beep indicator lets you know when the strand is done. What’s more, this Infiniti Pro Conair curling iron features tourmaline ceramic curl chamber that helps reduce frizz, protect your hair from damage, and add extra shine to your look. For me, it’s the best curling iron featuring auto-curl technology. 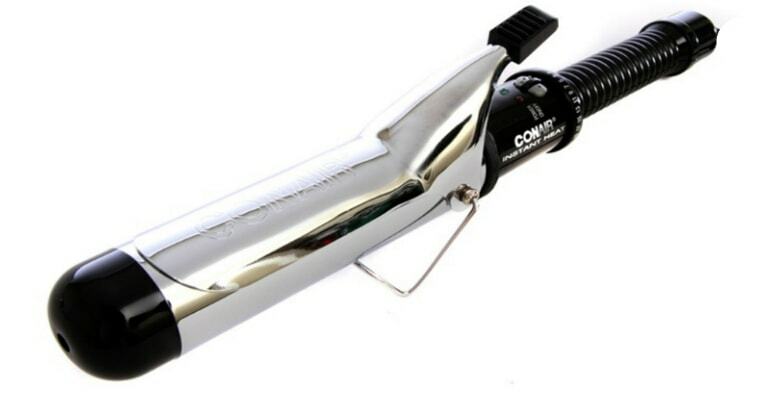 To use this Conair curling iron, you will definitely need some practice. Follow the instructions and comb your hair properly before styling. the package includes a chamber cleaning tool. you need some practice to avoid tangles and get used to the tool. This is the best curling iron for those who feel like making various styles with just one tool. You can use this tool for both curling and straightening, creating tight curls, beach waves or silky straight hair. According to the TYME curling iron reviews, there is a definite learning curve to using the tool. You will probably need some time to master it, so I’d recommend you to watch a couple of tutorials. This TYME iron features titanium plates, and that is quite a sturdy material. It works great on thick, coarse hair but if you have fine or damaged locks, you probably don’t need something that powerful. There are 5 heat settings, ranging from 300°F to 400°F. The tool gets hot rather quickly, and it has the temperature memory, meaning that it turns on to the last used setting. needs some practice to master. Looking for a curling wand that creates large, loose curls? Then this one is just for you! 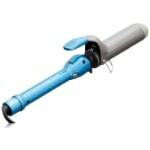 Due to its wide tapered barrel (1-1.5 inch), this Remington curling wand will help you to make large elegant curls. It features the pearl ceramic coating that smoothes hair. 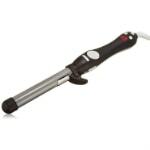 This wand curling iron heats up in 30 seconds, and the maximum temperature is 410°F. The current heat level is shown on the display, and there is a temperature lock as well. The only thing is, it may take some time to understand how to use this curling wand. To master this tool, I’d recommend you to watch some tutorials. needs some practice to perfect the technique. This BaByliss Pro curling iron features 1.5-inch barrel that is great for making loose curls and waves. The wand itself and the handle are rather long which is especially useful if you have really long hair. The problem is, the tip is hot and disproportionally small. It’s difficult to hold the end and avoid getting burned. 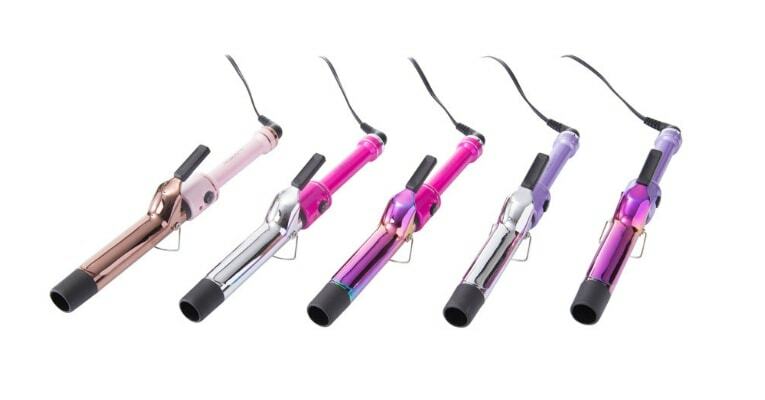 This BaByliss curling iron features the ceramic titanium barrel, and titanium is the kind of material you don’t want to use on fine or damaged hair. There are as many as 50 heat settings, and the maximum temperature is 450°F. 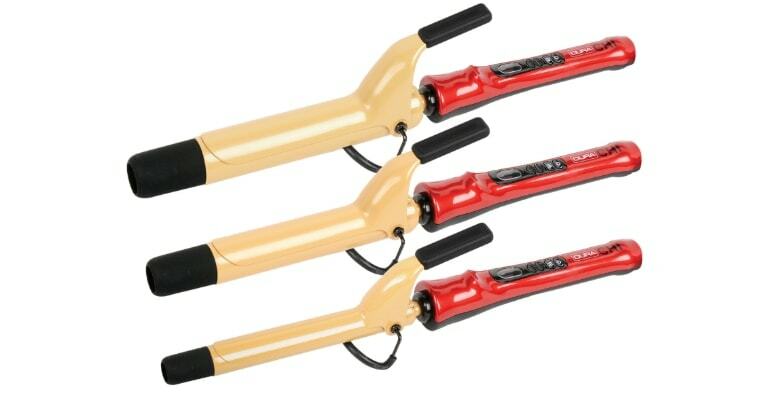 Due to the special ceramic technology, this 1 1/2 inch curling iron will leave you with smooth and frizz-free locks. the long barrel makes it easier to curl long hair-foot swivel cord. be careful with the tip to avoid burning. This Helen of Troy curling iron brush is a real catch for women with short and shoulder-length hair. It features 0.5-inch barrel, and there are not so many curling irons with such small barrel. The plastic tips with tiny rounded ends gently grip your hair and prevent scratching your scalp. Easy to handle, lightweight, and stylish – it’s got a lot of merits. For me, it’s one of the best curling irons for short hair. If we’re talking drawbacks, there are only 2 heat settings, and the tool takes longer to heat up, comparing with many other curling irons. On the bright side, this brush iron is easier to use than a regular curling iron. It helps you create shiny and charming curls with minimal effort. after a couple of months, the bristles fall off easily. Just like the Conair curling iron in this list, the CHI Air Spin rotating curler features this awesome auto-curl technology that makes styling easier and cooler. You just have to put a small strand into the curl chamber, wait for a couple of seconds, and voila – straight hair has turned into charming waves or curls! 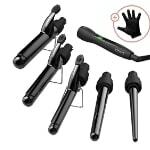 This CHI curling iron features 1-inch ceramic rotating barrel and two curl direction buttons that allow you to curl either toward your face or away. The temperature is adjustable, and the current heat level is shown on the digital display. For loose curls or waves, you need lower temperatures. The higher the heat is, the tighter the curls will be. You will probably need some time to get it down. Follow the instructions and feel free to watch tutorials on how to use this auto rotating curling iron – they will come in handy. By the way, there is a post about top 5 CHI straighteners for the fans of the brand. if you put too much hair in the curl chamber, it tangles. This Beachwaver curling iron lives up to its name – you can create loose beachy waves, defined curls, and glam waves with just one tool. 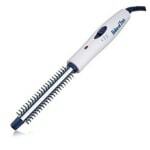 It features 1-inch ceramic barrel that distributes the heat evenly, giving you shiny and smooth results in a matter of minutes. The most amazing thing here is that the curls last for 2 or 3 days! You can adjust the temperature from 290°F to 410°F, and this curling iron gets warmed up in 30 seconds. Also, it has a fast/slow speed switch which is quite a rare feature for curling irons. For me, this is the best curling iron for any styling – from defined curls to relaxed loose waves. Perfect styling tool for making loose curls and relaxed waves. This Revlon curling iron features a 1.25-inch barrel with ceramic tourmaline coating that reduces damage and adds extra shine. The clamp is firm, and the handle is comfortable to hold. The cool tip has just the right size to protect you from burning but still, always be careful when using a curling iron. 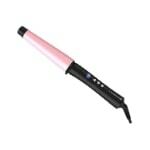 This 1 1/4 curling iron gets hot reasonably fast, and there are as many as 30 temperature settings you can choose from. With the dial-up temperature knob, adjusting the heat is easy as pie. Overall, this Revlon curling iron is more than a decent tool that offers excellent value for money. the clip of the tool may feel too tight. 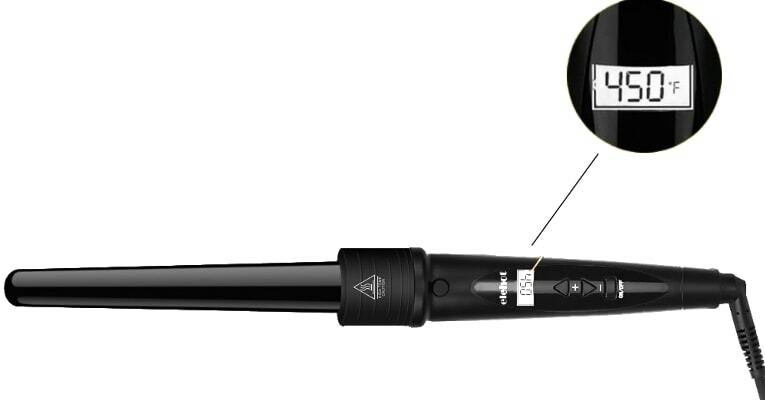 The most remarkable feature of this t3 curling iron is its interchangeable design. There are 7 portable barrels you can attach to the base to make various hairstyles – loose waves, polished curls, cascading waves, and so on. The only thing is, you have to purchase all these barrels separately, and they will cost you a pretty penny. 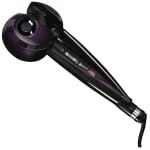 The tourmaline ceramic barrel provides even heat distribution leaving you with frizz-free and polished curls. There are 5 adjustable heat settings, ranging from 260°F to 410°F. 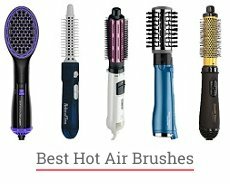 I’ve seen some reviews where people complained that the heat was hard to control and the tool burned the hair. I don’t have much experience with this t3 curling iron, so I got nothing to say. Just in case, be careful with this tool. the controls design is poor, and you may accidentally press the power switch. Using a curling iron isn’t that complicated. But for those of you who haven’t had such experience, I’ll try to make a step-by-step guide. So, how to curl hair with a curling iron? First, wash your hair and let it air dry. You can also use a blow-dryer, but when it comes to styling, the less heat is always the better. Make sure that your locks are completely dry. Do NOT apply a curling iron on wet or damp hair. This will cause a lot of damage. Apply some kind of heat protection on your hair. If you have thin hair that doesn’t take shape you can use some treatment to add a little bit of texture. Comb your locks properly to avoid tangles. It’s extremely important if you use one of these curling irons with auto-curl technology since they simply won’t work if there are any tangles. I recommend using a wooden brush. Divide your hair into two halves, and fix the upper one with something like a hair crab or a hair band. If you’re new to curling your hair with styling tools, start with lower temperatures so that you have time to figure out how to use a curling iron. Start curling from the roots to the ends, not the other way around. The ends are the most fragile part of your hair, and you may damage them with heat. On the contrary, the roots are the part that needs the most heat (but not too much of it). Take a small strand, put it in between the barrel and the clamp, and delicately wrap it around the barrel. You don’t have to press the clamp all the way down. After a few seconds, gently release the strand. Your curling iron package should include the detailed instructions on how long you should wait before releasing your hair. Repeat the same action with all other strands until your hair is done. If you want to have tight curls, just give your hair a little shake. And if you don’t mind having loose waves or relaxed curls, you can run your fingers through them to give your curls more natural look. Optional: fix your hairstyle with a little bit of hairspray. Here are some of the questions that you may have about curling irons – and my answers to them. Do curling irons cause any harm to my hair? Which ones are safer and why? 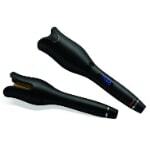 Of course, any heat-activated styling can cause damage to hair, especially if you use a styling tool wrong. But modern manufacturers tend to care about their clients (i.e. you) and constantly come up with new ideas about how to make curling irons safer. Ceramic and tourmaline coatings are considered to be the healthiest materials for the barrel. Sometimes, they get combined to enhance the benefits. Such curling irons heat up quickly, and the heat is distributed evenly. Due to the ionizing feature, they smooth hair, reduce frizz and static and add lots of shine to your locks. When it comes to styling, the less heat is always the better. Even if your hair is thick, dense and hard to manage – it will hardly benefit from high heat, speaking long-term. So try to curl your locks on the minimum temperature that works for them. Be especially careful if your hair is thin, damaged or color-treated. Always put heat protection before any styling – I know I say that a lot but there are still people who don’t do this! And never use a curling iron on wet or damp hair. It should be completely dry before styling. You definitely shouldn’t overuse a curling iron – like, curling your hair every day is not such a good idea. No matter how frequently you employ a curling iron, use it according to the instructions and take good care of your locks. I mean, there are so many creams, lotions, mousses and so on that you can find some treatment for you. They moisturize, nourish, and protect hair from heat – and that is precisely what you need if you use heat-activated styling tools. Here you can read how your hair can benefit from hair straightening products. How Do I Treat Hair That Is Easily Affected by High Temperatures? First off, try to curl or straighten them on rare occasions when you really want to change your look. This may be your birthday, your friend’s wedding, your parents’ anniversary, you name it. I bet you get the idea. Still, if you do want to make your hair curly with the help of a curling iron, I have some advice for you. Choose hair products that are suitable for your hair type and its overall condition and see how they would work. Use moisturizing products such as shampoos, hair conditioners, creams, balms, and so on. Once in a while, use hair masques to help your hair restore after high temperatures. Argan, coconut, olive and some other oils will be a great help, too. Reduce usage of a blow-dryer. Let your hair air dry when it’s possible. Get your hair tips cut on a regular basis, especially if you have dry split ends. How to Curl Your Hair without a Curling Iron? First, curling hair with a flat iron is actually a thing. You just need to choose the right shape and design, not to mention the temperature settings. 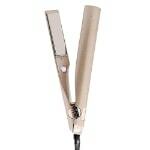 If you want to curl your hair with a flat iron, you will need a rectangular-shaped model with curved edges. Depending on what type of curls you want, you can go for wider or slimmer plates. Wide plates will create large, loose waves, and thin plates are suitable for making tight curls. For me, one of the best flat irons for curling hair is the Remington flat iron that features 1-inch wide ceramic plates. 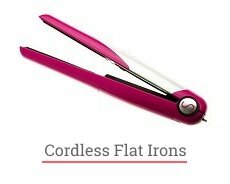 It can serve as a 2 in 1 straightener and curling iron. Another option is going in for a permanent curling treatment at a salon. In this case, a curling iron is replaced by curling rods. This process changes your hair structure, so there are drawbacks as well. Permanent curling treatment can damage your hair and make it fragile and vulnerable, so think twice before making an appointment with your stylist. It’s obvious that it should be a reputable and trustworthy stylist, right? Okay, that’s all I wanted to tell you about curling irons. I believe we’ve considered the matter in all its bearings, haven’t we? Not only have we taken a look at the best curling irons but also explored their features, benefits, and impact. Quite a meaningful talk, right? I hope now you know how to use a curling iron and how to take care of your locks so that they stay healthy and good-looking. 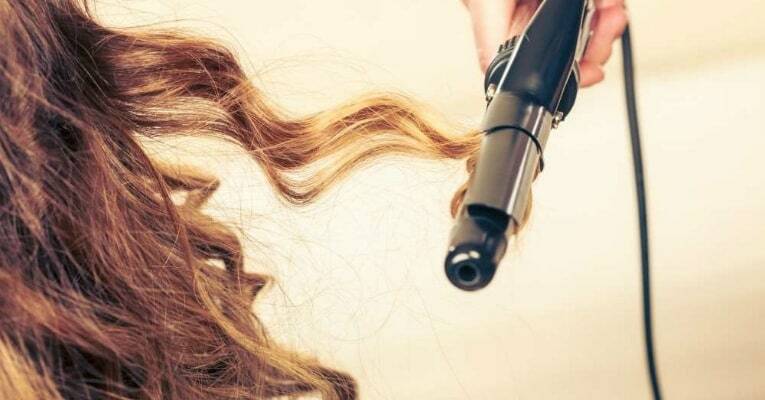 If used properly, curling irons shouldn’t cause much damage to your hair. But better safe, than sorry so take all the safety measures when styling. I guess this is it! Ladies, what else do you want to know about curling irons? Have you ever used one of them and if so, what is your first impression? Which one do you like the most? Feel free to leave your comments below! I have recently find your blog and its just awesome.Got a lot of unique and informative stuff here . thanks a lot and keep sharing up.Good Luck!. I’m glad to see that the best curling iron I’ve ever used is in your list too, Monica. The device I’m talking about is CHI Air Spin N Curl 1 Inch. It is exactly what I need for styling my hair. I had another CHI curling iron once and it was ok too but this one is something fantastic. Never before I was able to handle my hair so quickly. Another feature I like in this tool is that sound alarm while curling – it’s very convenient. Nice article, thanks for sharing it with us! Thanks for the review, Monica! I’m a big fan of your blog and you really helped me out with your advice a couple of times. After reading your article I should say to all your readers that Conair Infiniti PRO Secret curler is the best decision for women with long hair. My hair is very long and it’s very difficult to form curls on it using other curling irons. I was really tired of straight hairstyles until purchasing the model you described here. After buying Infiniti PRO Secret I totally changed my hairstyle as I wanted to for a long time. An awesome tool which forms awesome curly locks even with long hair, nothing to add. These are really good curling irons you described here, Monica. I already tried using a couple of models you mentioned here. I used to have a TYME Iron PRO curler and what I liked most about it is that it could make both curly and straight hairstyles – very convenient for wavy hair type as I have. Another tool I tried from your list is T3 Twirl Convertible Curling Iron. My friend has such a model and I had a chance to try it. The idea with these interchangeable barrels is what I like a lot about it. The result after using T3 was beautiful too, so I can recommend it to anyone.